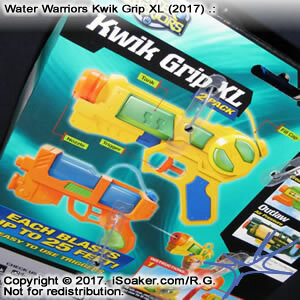 The Water Warriors Kwik Grip XL (2017) water blasters are re-styled versions of the original Water Warriors Kwik Grip XL (2004) by Alex Brands Buzz Bee Holdings LLC for 2017. 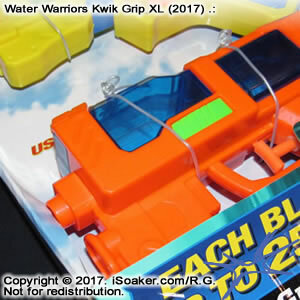 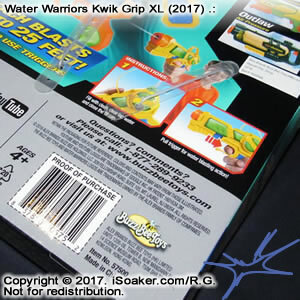 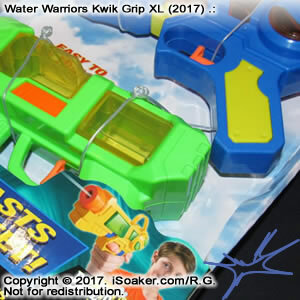 The Water Warriors Kwik Grip XL (2017) water blasters I found were being sold as 2-packs. 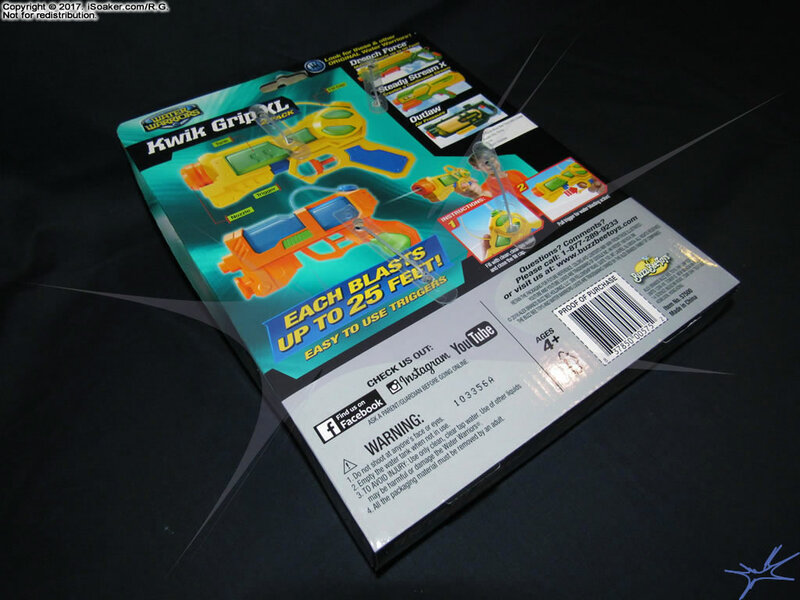 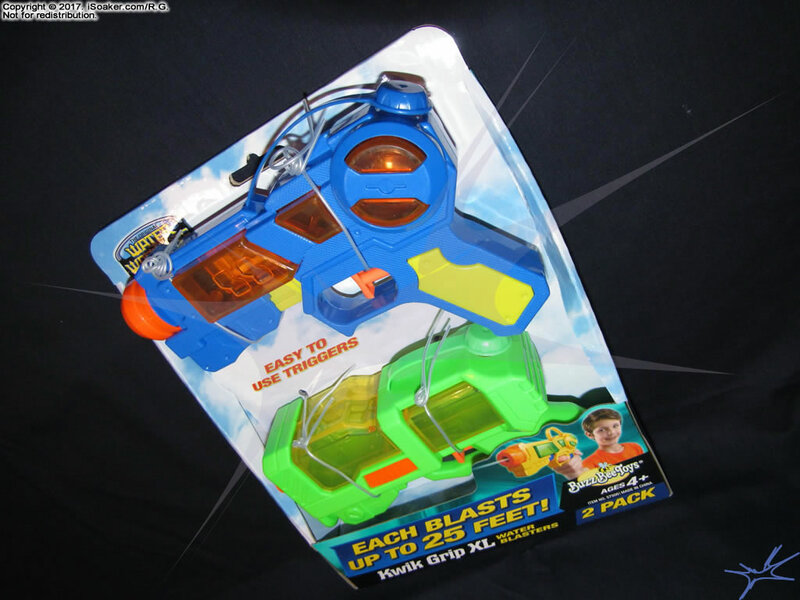 One pack contained the blue and green versions while the other pack contained the yellow and orange versions. 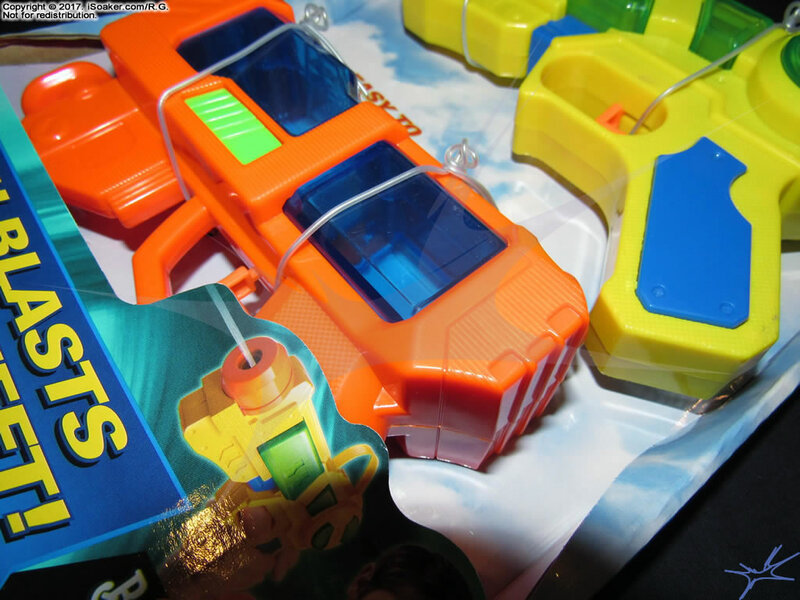 The blue and yellow versions appear to have the same styling, but molded in differing colours. 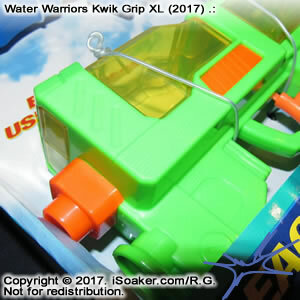 Likewise, the green and orange versions also appear to have the same styling, but molded in different colours. 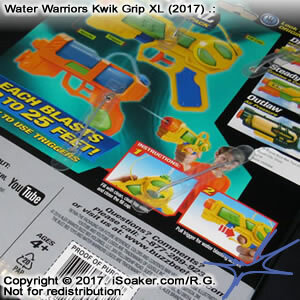 These water blasters will likely also be sold separately or in packs of four at some point, but currently, I have only seen these 2-packs. 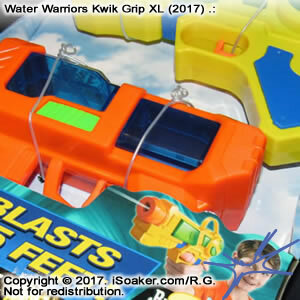 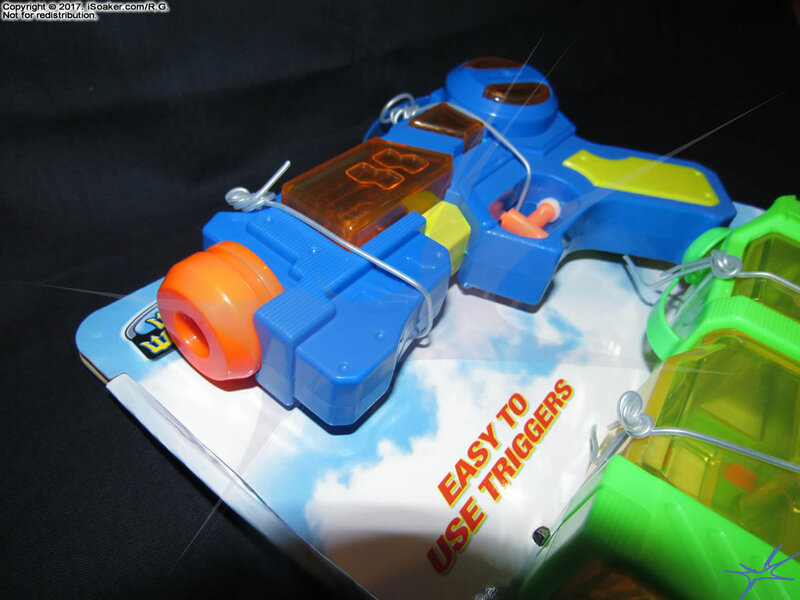 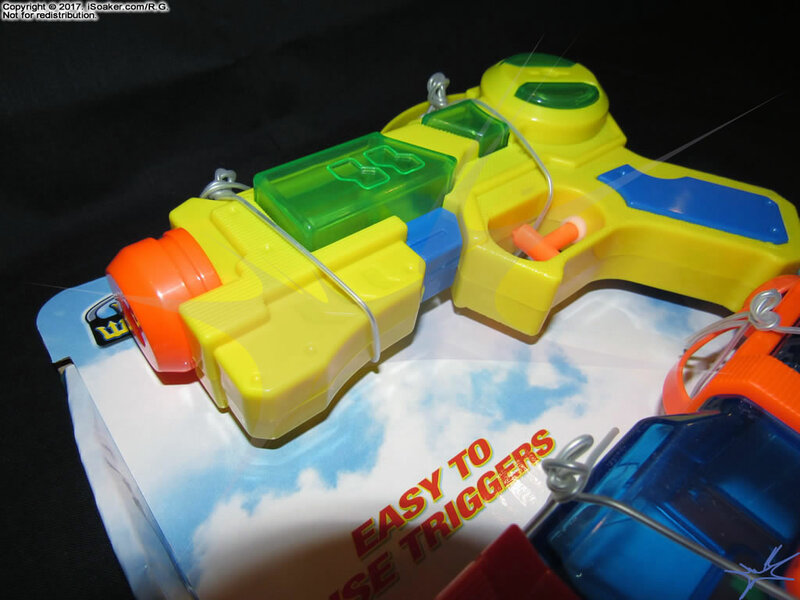 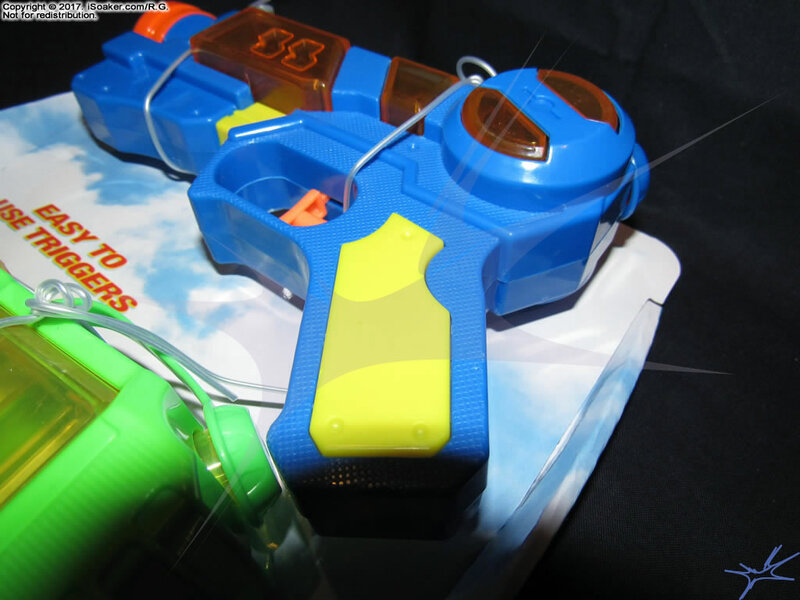 Each water blaster is secured to the cardboard packaging using two wire twist ties. 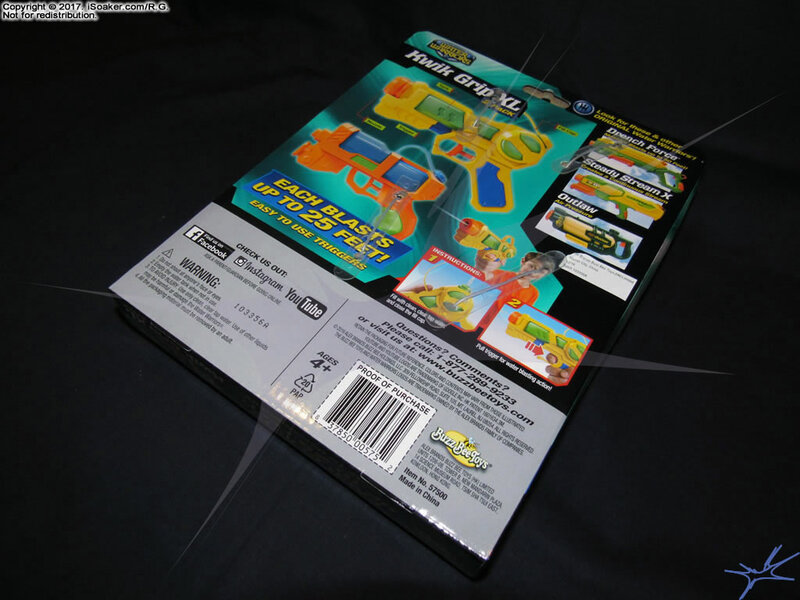 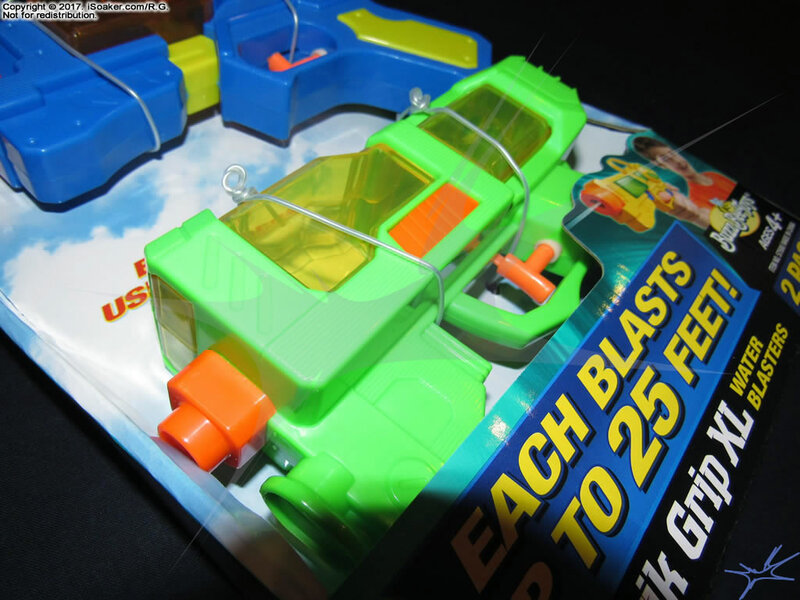 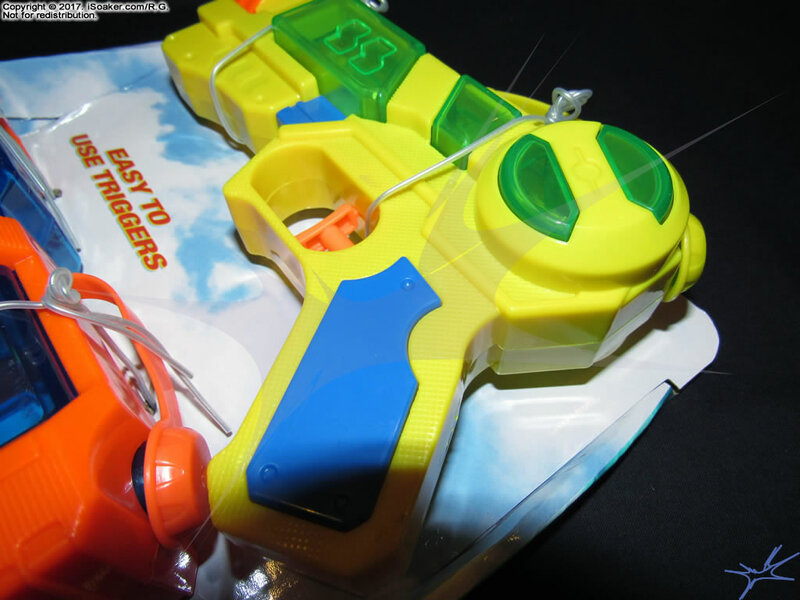 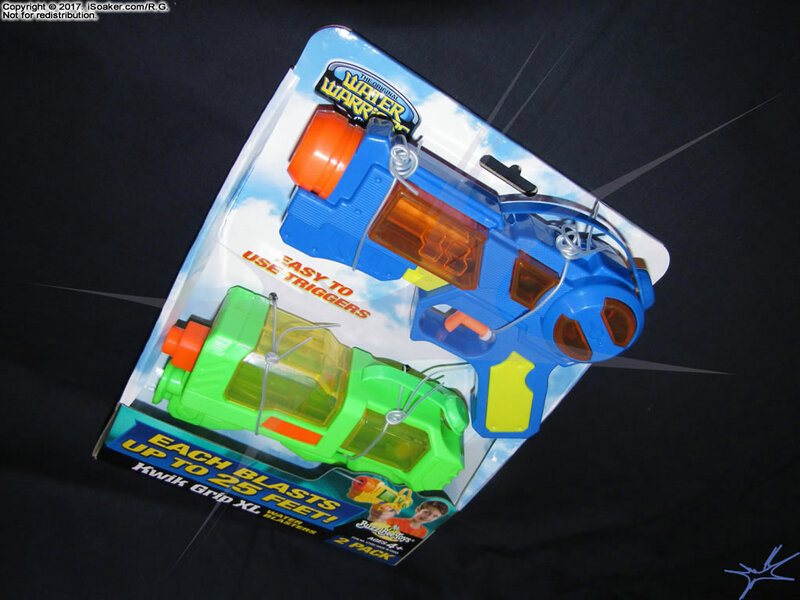 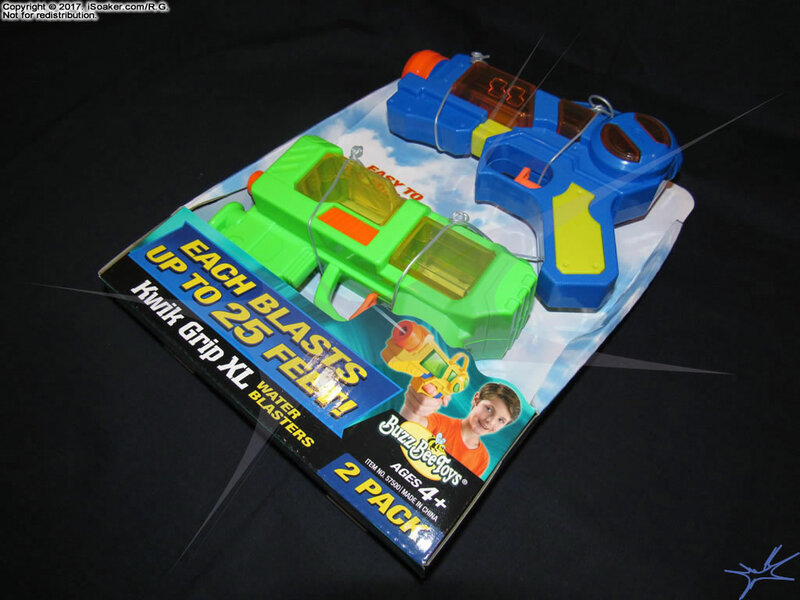 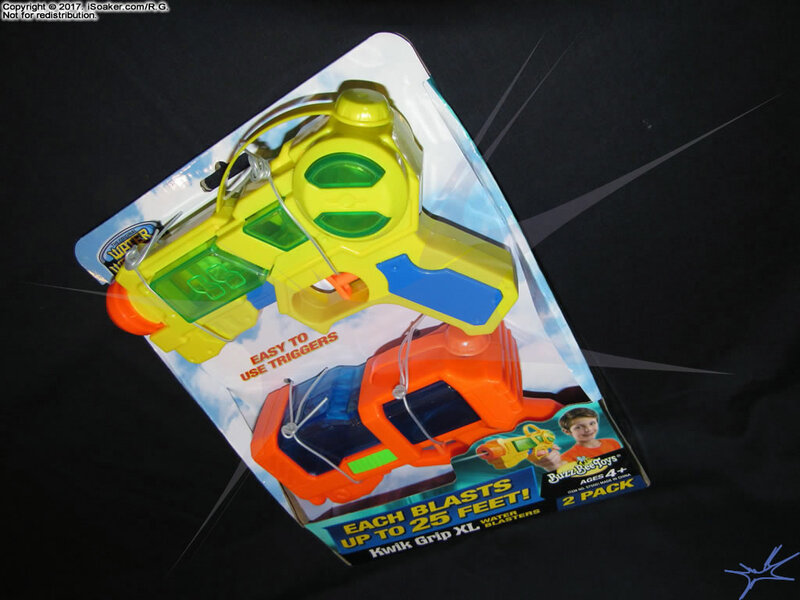 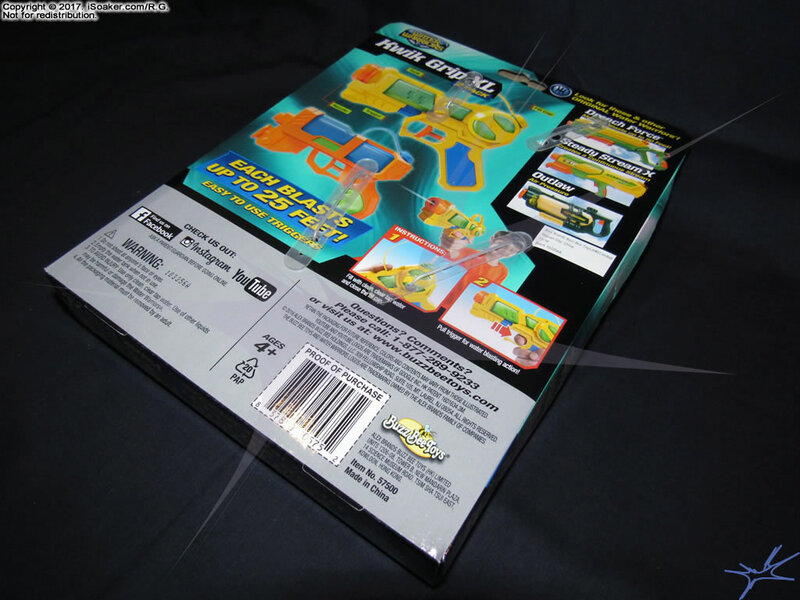 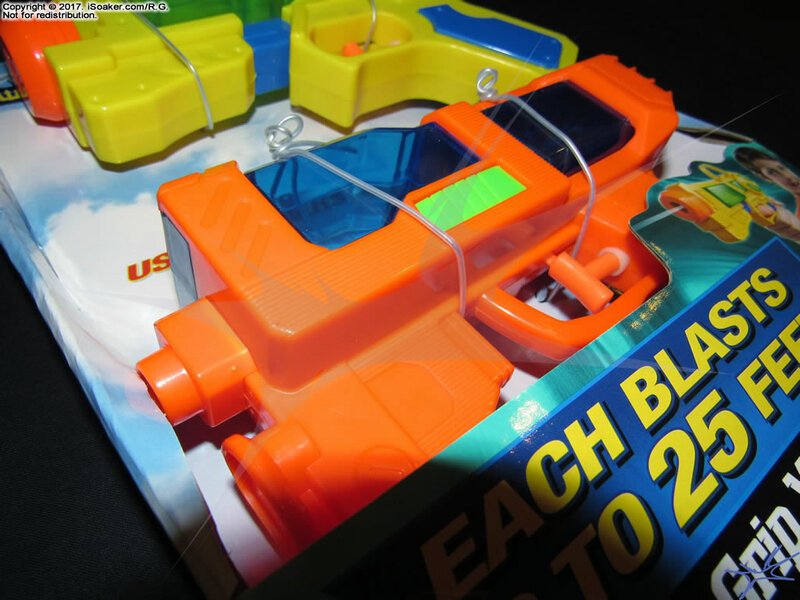 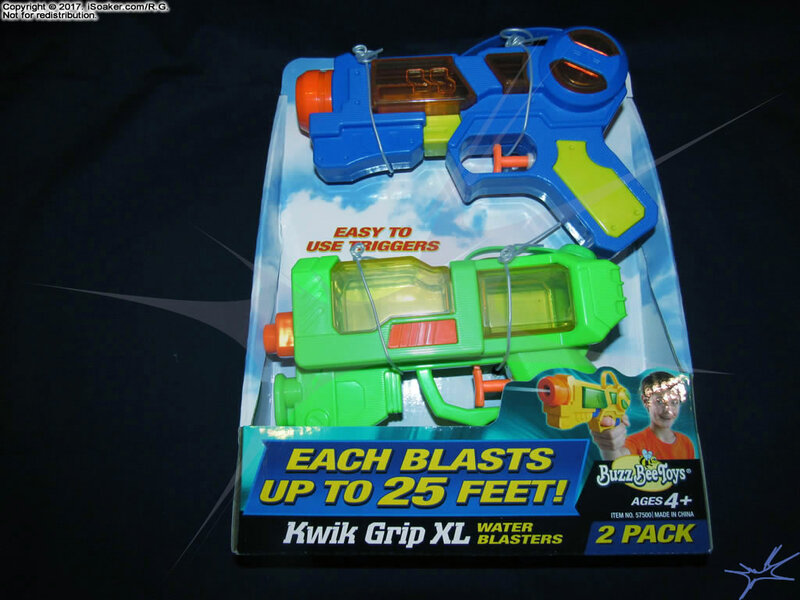 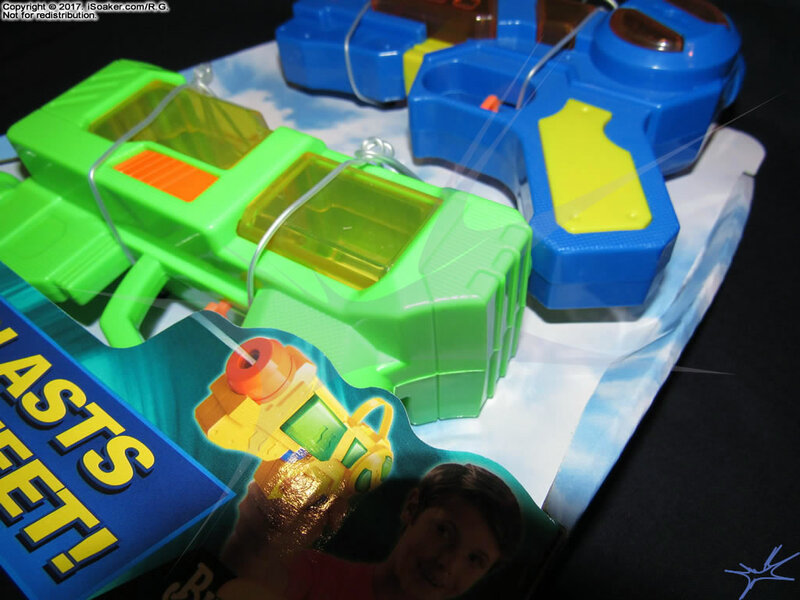 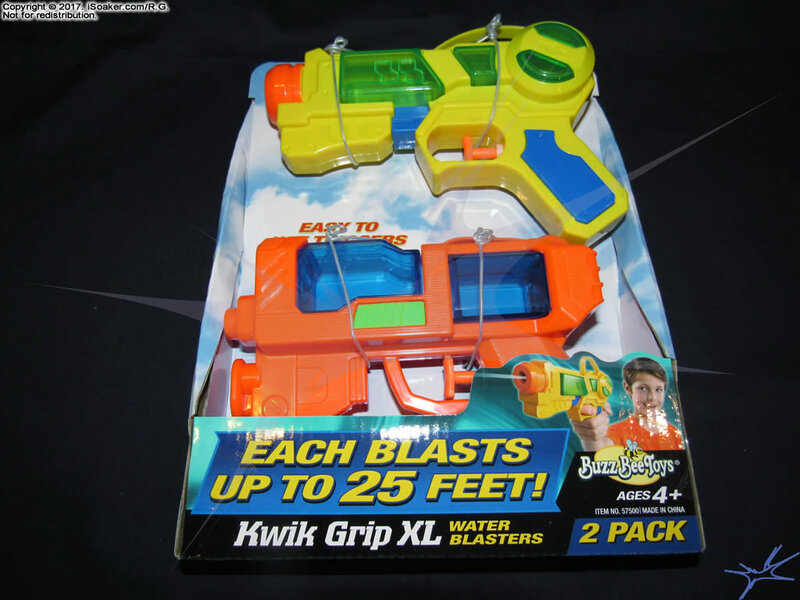 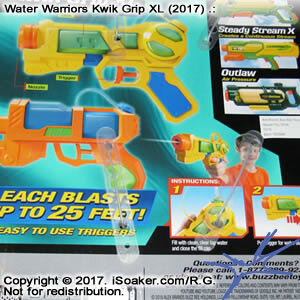 Packaging is simple and functional, though the lower water blaster in both packages is partially obscured by the front panel of their boxes. 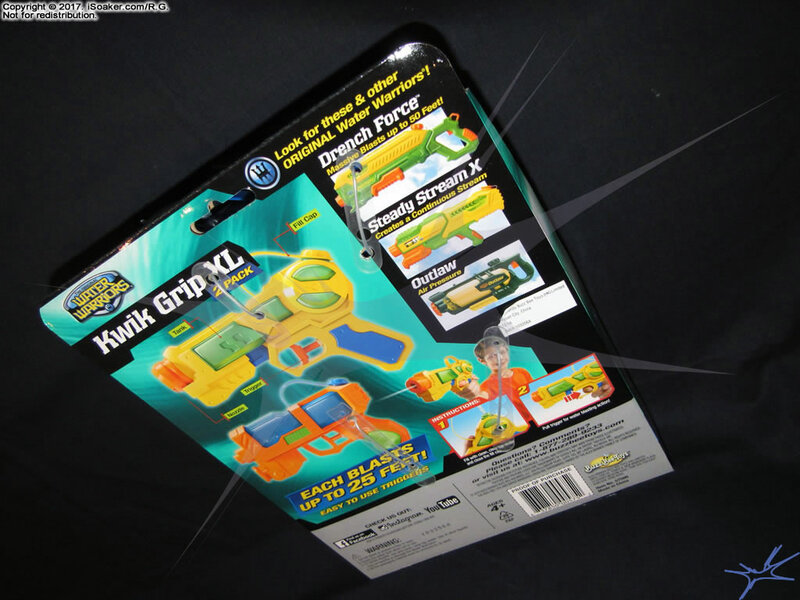 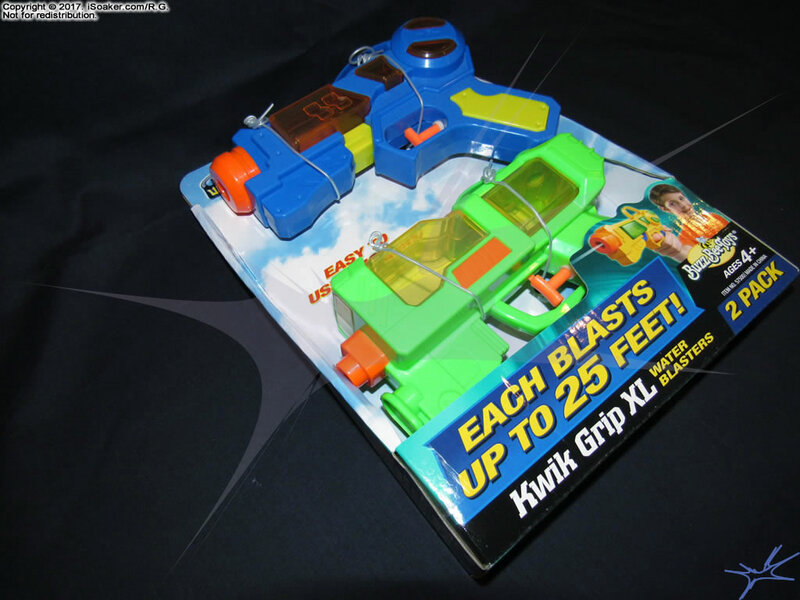 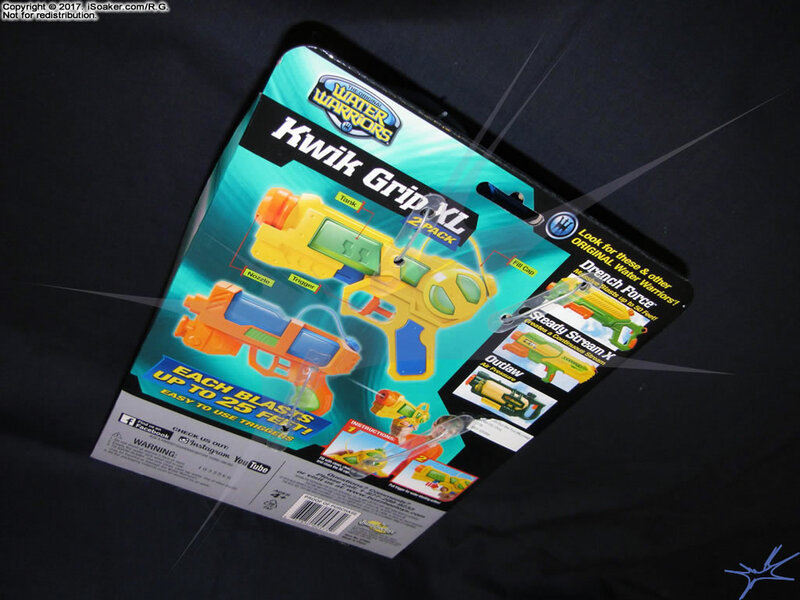 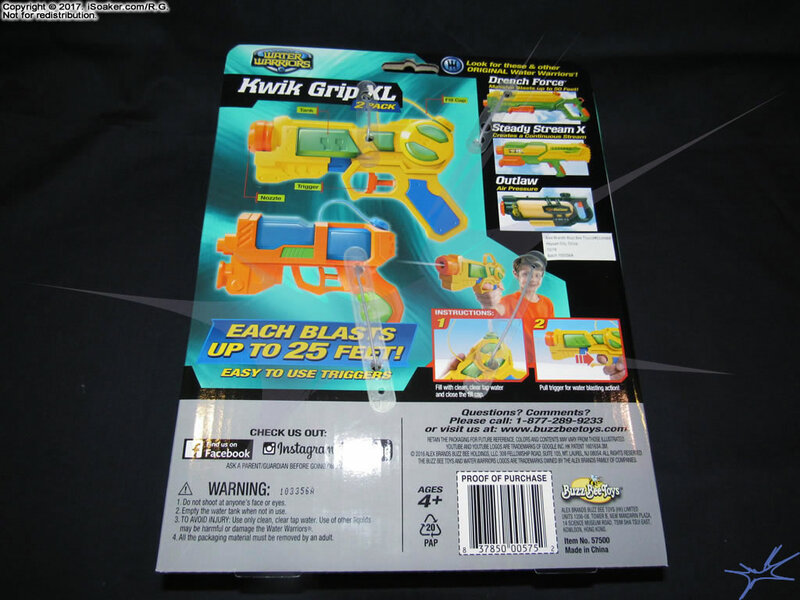 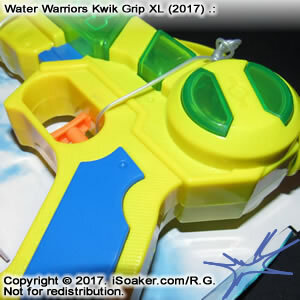 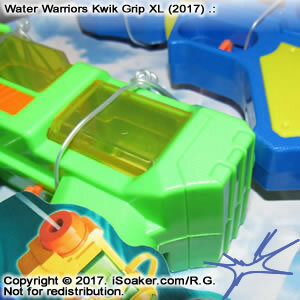 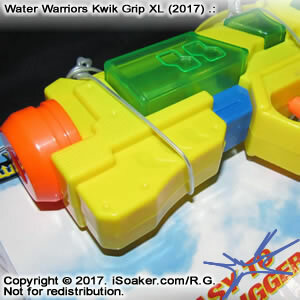 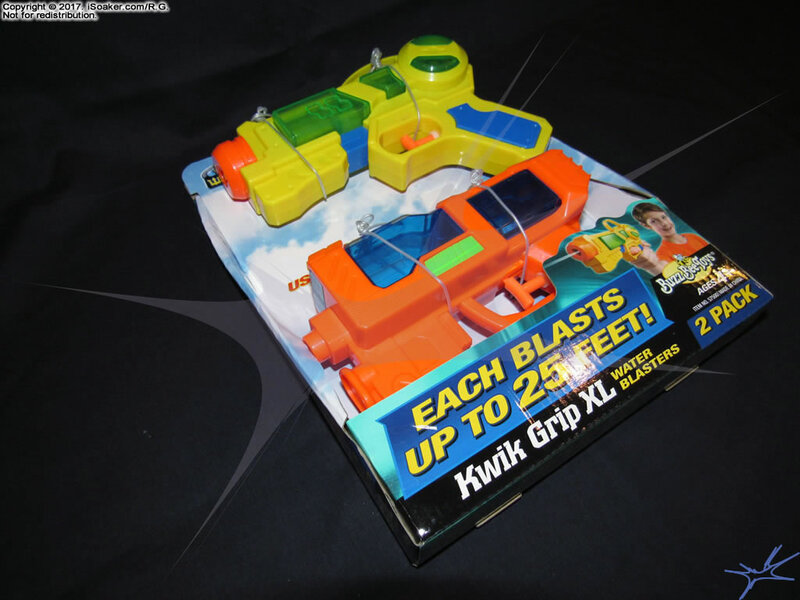 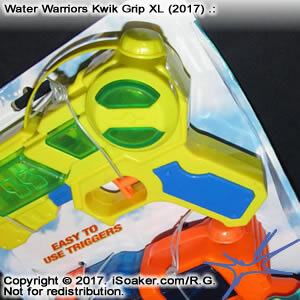 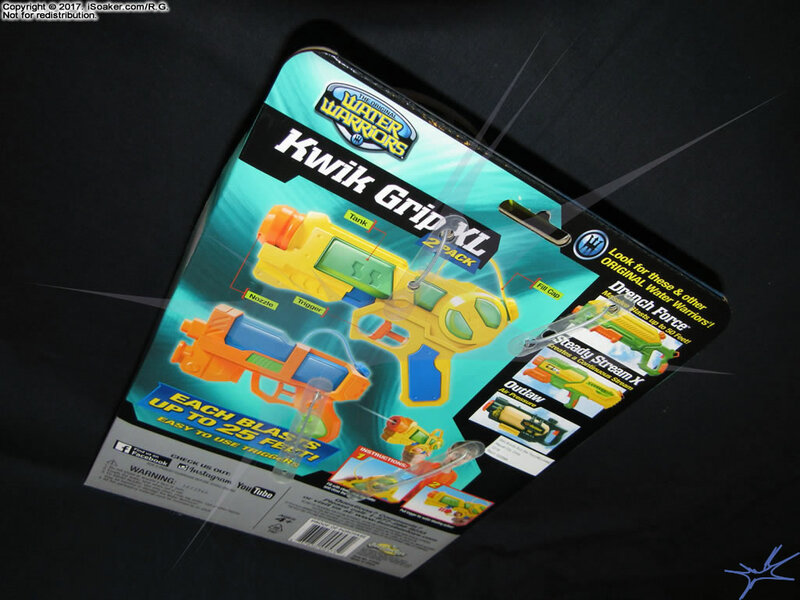 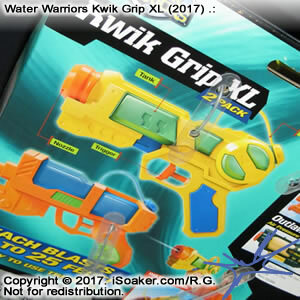 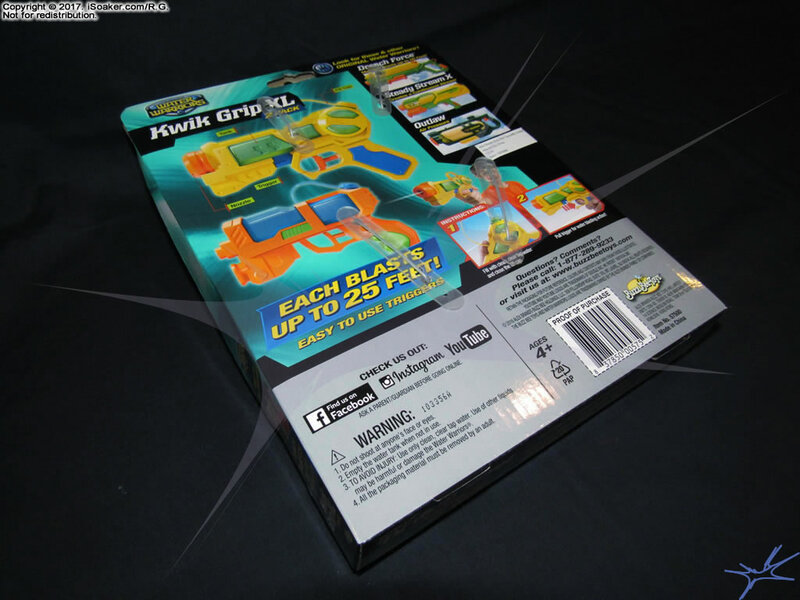 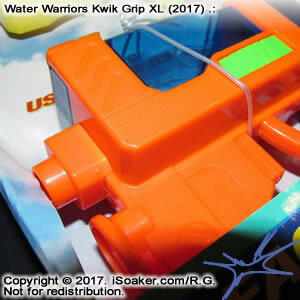 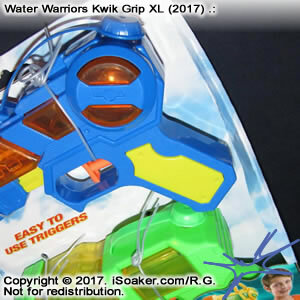 The design of the Water Warriors Kwik Grip XL (2017) water blasters is much more chunky and angular, especially when compared with the original rounded Water Warriors Kwik Grip XL (2004). 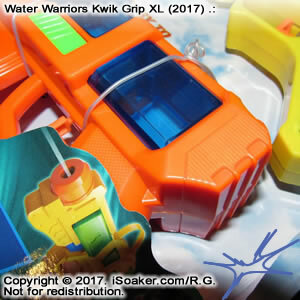 The number of colours per water blaster is reduced, but this gives each model a cleaner look. 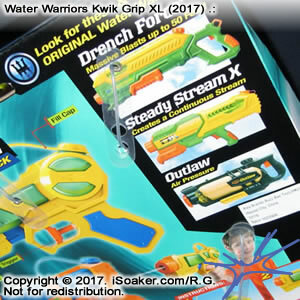 The transparent reservoirs enhance their looks, emphasizing the depth of these water blasters. 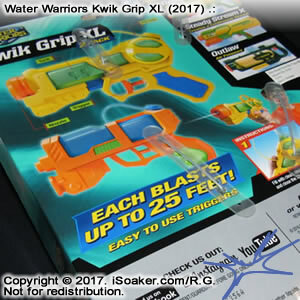 Each of these Kwik Grip XL (2017) water blasters is made from decent quality plastic and feels sturdy. 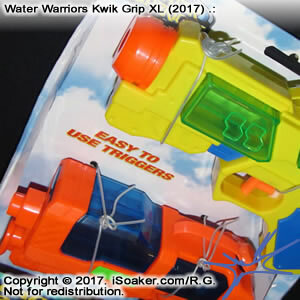 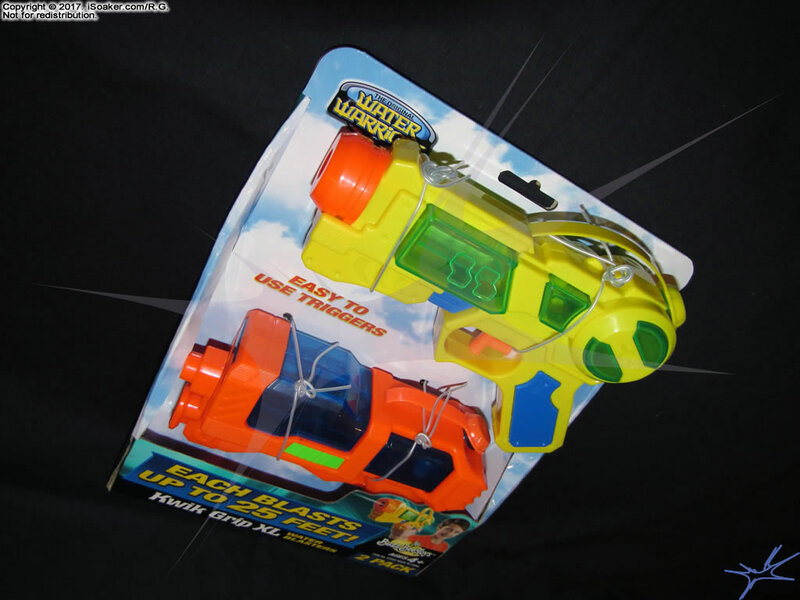 Their better durability is one factor that makes these water blasters a better investment over the cheap "dollar store"-type squirt pistols. 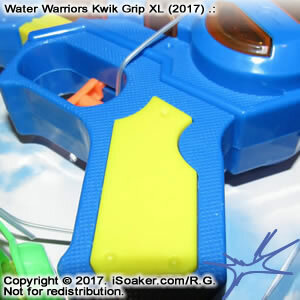 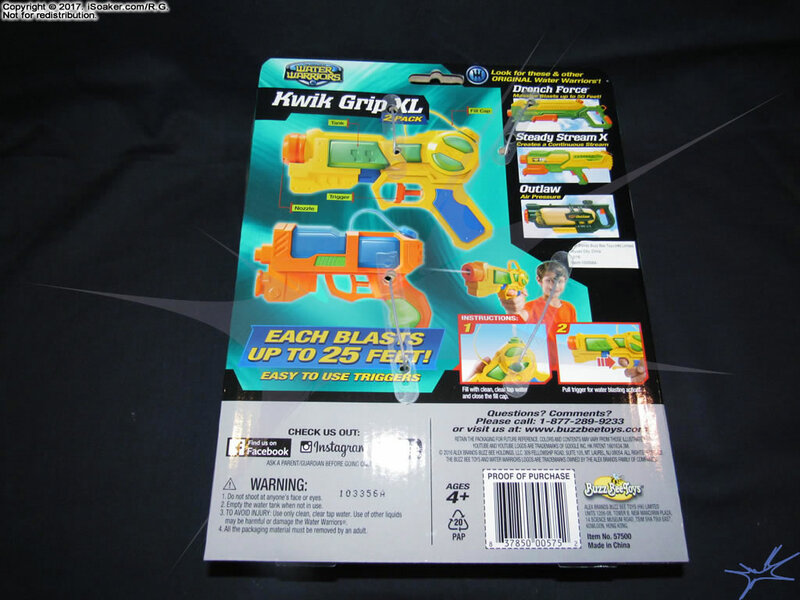 The trigger/grip region is larger than those found on the Water Warriors Kwik Grip XL (2004), but may still feel short to those with larger hands. 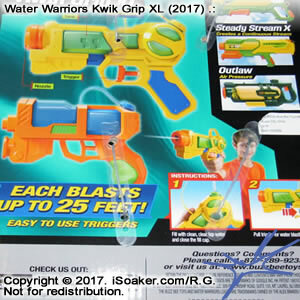 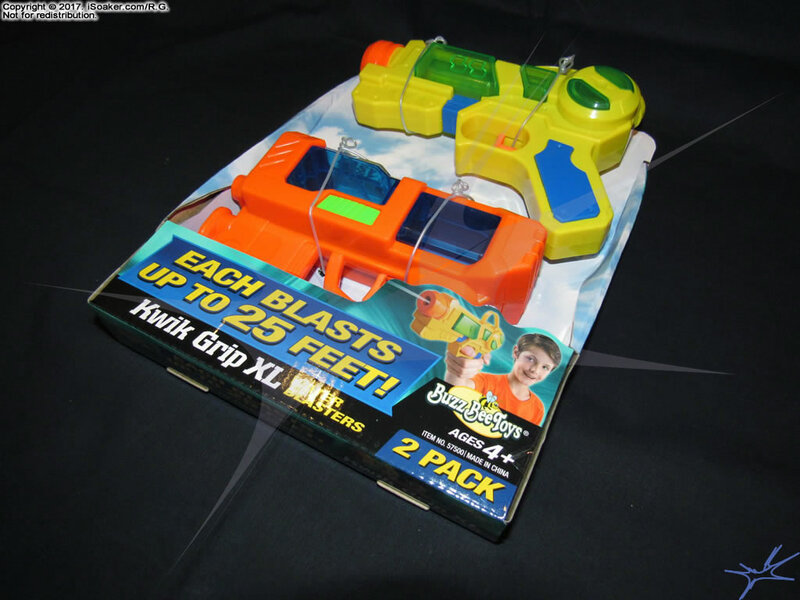 Of course, these water blasters are primarily targeted at children ages 4 and up, thus the handles should not be that large. 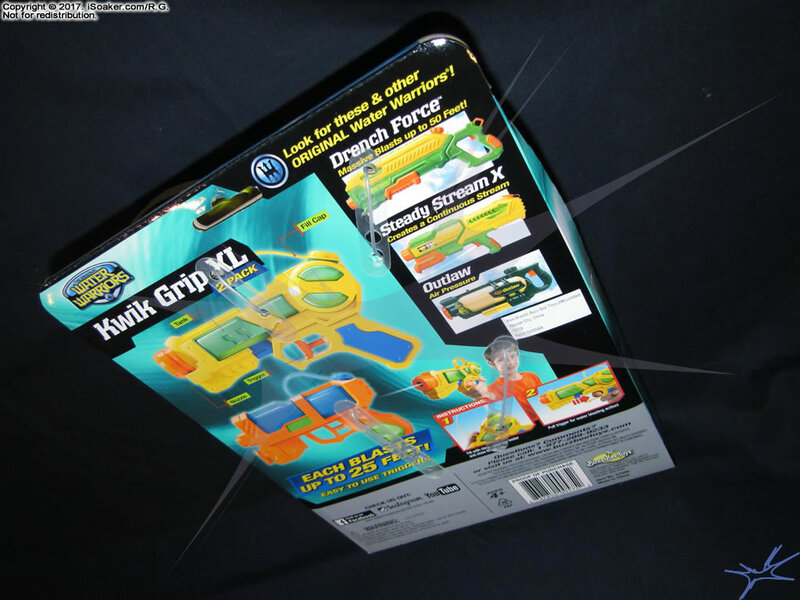 The simple pull-trigger pumping mechanism is easy to use and produces a decent stream for its size. 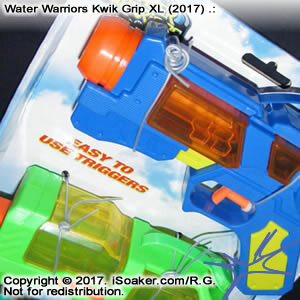 The Water Warriors Kwik Grip XLs (2017) perform well for trigger-based water blasters. 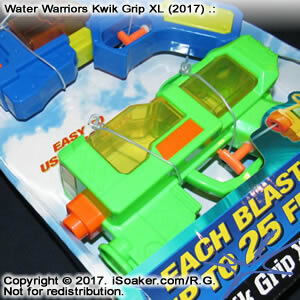 Performance is more consistent than "dollar store"-type squirt pistols, though obviously much less than most larger water blasters. 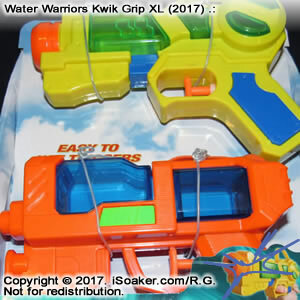 Targeted to younger children, these water blasters are great for having carefree water fights without worrying about anyone getting too wet too quickly. 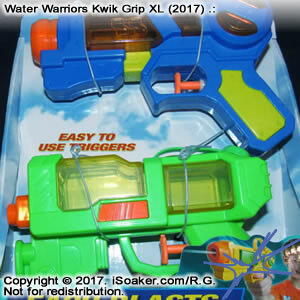 Unfortunately, these new designs hold about 30% less water than the original models. 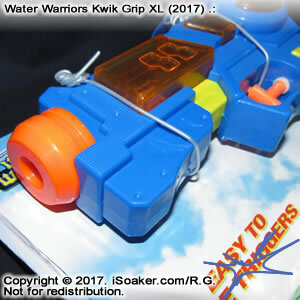 However, their reservoir still provides will over a hundred shots per filled reservoir. 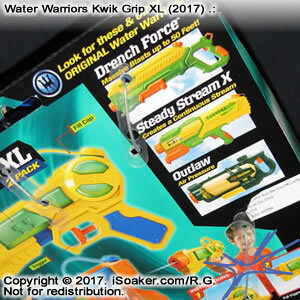 While outclassed by most pump-action and/or pressurized water blasters, the 2017 Kwik Grip XLs remain a solid choice for younger water warriors and may make a fun "last resort of one's last resort" water blaster in larger water war games. 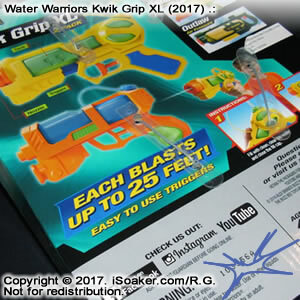 Trigger-based pump means limited range and output; less capacity than the original Kwik Grip XLs.